Caramel Santa's are a perfect Christmas candy for filling your Christmas stockings. 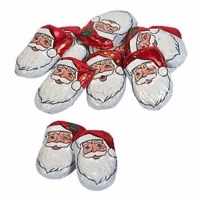 Each chocolate candy is in the shape of a Santa face and filled with a creamy caramel. We have all your favorite Christmas candy. Chocolate coal, bubble gum coal, gummy lifesavers, trolli sour brite candy canes, Reese's peanut butter trees and Christmas dots.